Dr. Goddard’s article “merely sample[s] a few key issues” on the topic. Below you will find an infographic co-produced by Mormon Infographics and Evidence Ministries. 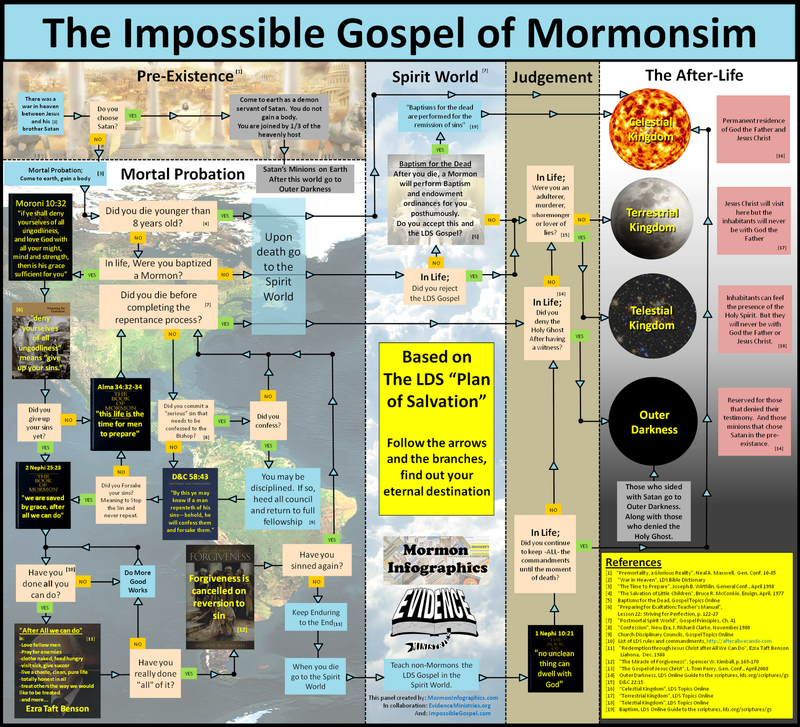 This presents a broader picture of the gospel “restored” by Mormonism. Below that you will find another infographic, this one of the Christian Gospel as set forth in the Bible. This entry was posted in Gospel, Salvation and tagged Gospel, Impossible Gospel, Mormon Salvation, Salvation. Bookmark the permalink. You made choices. Choose the right when a choice is placed before you. You seem to pick out little things and make a mountain out of them. Maybe I am doing the same thing when I look at history. I have found that some things need to be dropped for the sake of spiritual health and that is the choice I make. So Brigham Young teaching that Adam was God was a “little thing”? Maybe to you, but not to me. And that is just the tip of the iceberg. Jo Smith was a liar. He was an adulterer. He was a murderer. (Those pesky Danites who murdered Missouri State Militia at Smith’s order). Jo also changed revelations, made additions to history that never happened, was a false prophet and dabbled in the occult. These are not little things. And this is only Jo and Brigham. I can go on and on until they clammed up at the beginning of the twentieth century by orders of Joseph F. Smith. Jo Smith was NOT the “Lord’s Servant”. It is not really practical to address every single quote, especially considering the number given and the speed at which the discussion progresses. Rather, let us address all the quotes as a collective by pointing out a very simple fact that most people seem to forget or ignore. These quotes are not given to the world, but to the members of the church. That is the intended audience, and with this comes the assumption that the members have an understanding of the fundamentals of the gospel and have, at least to some extent, progressed in their lives. So, when we realize that the members understand that the grace of God and the Atonement is always present in all the doctrine of the church, it becomes unimportant, and even tiresome, to restate that fact every time you wish to speak on a given subject. Speaking of these quotes specifically, it is understood by the speaker that the intended audience will know that through the grace of God and repentence that all that is required of us can be attained, and as long as we are honestly striving to live all the commandments God will not find us guilty at the judgment. As long as our desire is only to do righteous and glorify God, and we strive with all our power to fulfill this desire, we will be judged to be righteous, and receive a Celestial Exalted glory. That is the most basic of the doctrine, and what all these quotes assume. So, when they speak of keeping all the commandments, what they are addressing is the same thing that James Addresses in his apistle (2: 10); that we cannot expect to enter the Celestial Kingdom if we do not try to obey. I am reminded of the story of the woman who said “I do not believe that God will keep me from the Celestial Kingdom just because i drink one cup of coffee each day.” This woman was trying to excuse her sin, and thus in her heart she was not keeping the commandments. This attitude will inevitably result in us loosing the highest reward that could have been ours. We must not think like this. As James put it, “For whosoever shall keep the whole law, and yet offend in one point, he is guilty of all.” In other words, it doesn’t matter if we are perfect in everything else, if we keep one sin we will still be cast out as if we had never repented. Again, when we understand the fundamentals of the doctrine we can see the true meaning of what all these quotes means. when we realize that the members understand that the grace of God and the Atonement is always present in all the doctrine of the church, it becomes unimportant, and even tiresome, to restate that fact every time you wish to speak on a given subject. As James put it, “For whosoever shall keep the whole law, and yet offend in one point, he is guilty of all.” In other words, it doesn’t matter if we are perfect in everything else, if we keep one sin we will still be cast out as if we had never repented. where does James say that you will be forgiven from lawbreaking if you repent????? What James says is that if you break one commandment you are “convicted by the law as lawbreakers” and “have become transgressors of the law” and are “accountable for all of it”. There is nothing in James about a get out of jail free card called repentance for those so judged. The intended audience is unimportant, the only criteria is whether what was said is true. The Mormon desire to mislead in order to appear Christian is once again apparent & quoting from scripture does not make a doctrine scriptural. Your problem is that you are UNABLE to understand Christian doctrine; my use of ‘unable’ is quite deliberate because until you come to know the God of the Bible you will remain blinded by the god of this world. No matter how you twist & turn, no matter how you much you misrepresent your beliefs in order to appear Christian you cannot drag yourself out of the quicksand created by your false prophets. Grace & works would appear to be interchangeable concepts in the ever changing world of Mormonism. You talk about Grace & then, by saying “as long as we are honestly striving to live all the commandments” you make Grace conditional upon works. You cannot avoid the trap set by your own words; Mormons are continually striving & will always fail, why? Well, you quoted from James but as so often happens you used only verse 10, did you read the preceding verses 8-9? James is talking about the ‘Royal law’ & the penalty for transgressors. Are you trying to tell everyone here that you, whenever you have transgressed that royal law, have repented of that sin; have you even been aware of your transgression? If you can answer that in the affirmative then you must be the first man since creation to have done so. If you wish to use that as proof of your position then first of all you must prove that drinking coffee is a sin. You shouldn’t use that quote from James if you want the above to be taken seriously & you’re defeating your own argument about grace by saying she was not keeping the commandments. Your attempts to give the commands of false prophets the same relevance as James 2:8-10 simply doesn’t work & although you may be using allegory my point is nevertheless a valid one. Ps. there is no celestial kingdom; that was an invention of Emanuel Swedenborg in the 18th century & adopted 50 years later by Joe Smith. Personally, I am ignoring almost everything you said. You made no comment that helps the discussion. We are not discussing your so called Christian Doctrine, but LDS doctrine. I don’t care what your doctrine is, or how much I don’t know it. It is unimportant when discussing the doctrine of my church. You make many claims but say almost nothing except the all to popular claim that “Since you are Mormon you can’t possibly understand anything.” I understand my doctrine very well, and it is you who doesn’t. I will only make one comment, as you have twisted my words and our doctrine so far that some untwisting is needed. This is where you are wrong. I have never made Grace conditional upon works. Salvation is what is conditional upon works, not Grace. They are two very different things. Grace is a free gift giving to all who seek out Christ and his gospel. However, Salvation is not a free gift, but is conditioned on our works; which works we are able to perform because of Grace, and thus it is through Grace we are saved. Do not try to twist my words or our doctrine. I don’t think you quite get my drift. Actually, maybe you do. I have always found the doctrine of popular Christianity to be far to simple. They don’t actually seem to have much substance. In all my dialogues with people there seems to be only one doctrine, and anything outside of that doctrine is deemed heresy. Now, I know this is an exaggeration, but do you understand what I am talking about. The LDS doctrine is far more comprehensive in my experience; dealing with things and mysteries that most of Christianity finds blasphemous to even think about. When you have such much that you can talk about it becomes much easier to leave the fundamentals alone at times, assuming your audience will understand where you are starting from. Thus we see that Paul is specifically addressing the fundamentals, as he knew the Corinthians saints were not yet ready for anything else. When I am talking to those who do not yet have an understanding of the fundamentals of our doctrine than I try to teach those fundamentals before I ever go into anything else. But for others, who already know the Fundamentals, I speak on other things, teaching them greater knowledge and doctrine. Thus is what James is doing, speaking to the people with the understanding that they already understand the Fundamentals. He doesn’t mention Repentance because he doesn’t need to, as his audience already understands it and can apply what he is saying in the context of that fundamental doctrine, as I have done. I think this is the greatest failing that many people have in reading the scriptures. They do not consider the audience and what they already know and understand. People love speaking of context, but this is part of the context, and yet it is so frequently ignored. Now, I will admit that, due to the lack of records, it is necessary to assume some of this context, and depending on your assumption is how you will take the words of these men. But I think it is greater folly to assume nothing. Mormon Infographics thanks you guys for the correction. I am not here to help you expound your false doctrines; I read your post & I responded to it by giving you the Christian view, What do you expect me to do, endorse all you say? Your arrogance is almost beyond belief, especially relating to that last sentence. As for ignoring what I say I expect that, it’s the usual way for a Mormon to behave when they have no answers. If you don’t care about Christian doctrine then why are you even here? Please tell me how it is possible to discuss Mormon doctrine on a Christian site if Christian doctrine cannot be mentioned? What you are effectively saying is that you must be free to expound your doctrines but will tolerate no criticism of them. Please show me where I said, “since you are Mormon you can’t possibly understand anything” Why do you lie about the things I say? I seem to remember that a while back you had a post deleted for exactly that reason & now you’re doing it again. My words were “Your problem is that you are UNABLE to understand Christian doctrine;” & that is a fact. Please show me where I said you don’t understand your own doctrine, yet another lie. “Salvation is what is conditional upon works, not Grace. They are two very different things. Grace is a free gift giving to all who seek out Christ and his gospel. However, Salvation is not a free gift, but is conditioned on our works; which works we are able to perform because of Grace, and thus it is through Grace we are saved. I made a mistake when typing, I should have said you make salvation conditional upon works & not grace, but because I made an error it does not make you right. Gods Grace brings Salvation & Salvation does NOT come through works, it comes through belief in the one who died for us & that is exactly what I was saying. So not only is Gods Grace unmerited Salvation is also. Now be good enough to show me where I have twisted your words. Ps. I’m sure you will be happy to read that we won’t be arguing anymore after this post as it’s time for me to move on. I don’t think I really belong in here, & although we’ve had a few unpleasant moments may I wish you all the best. They don’t actually seem to have much substance. In all my dialogues with people there seems to be only one doctrine, and anything outside of that doctrine is deemed heresy. That is because for Christians in reality there is only one doctrine. The Gospel. Teachings about sanctification or Church government or ethics or the end times are all just the outworking of the Gospel in time and space. I know this is hard for someone like your self to understand but it really is the case that the center of reality is a wooden cross in first century Palestine where the King of Glory died in my place. He doesn’t mention Repentance because he doesn’t need to, as his audience already understands it and can apply what he is saying in the context of that fundamental doctrine, as I have done. Don’t you understand that you are interpreting a text based on nothing but your own opinion of what James’s intentions were. I could just as easily say that James does not mention that Christians are not obliged to keep the law because his audience already understands this. In fact if I was a Hyperperterist I could say James that does not mention that the final Judgement has already occurred because his audience already understands this. That sort of approach makes the bible a wax nose to bend and shape at your will. No,it is not just my opinion; but yes the basics of what you say is correct, which I have already stated, so you asking me if I know this shows that you didn’t read or comprehend my words. Yes, some assumption is needed, but then it is needed for you as well, as you are assuming that he didn’t intend this. This was my point when I said that no assumption is the greater folly. Now, I assume his intentions based partly on the very fundamental teaching of Christ to preach repentence and baptism (luke 24: 47). This has always been the first principles taught in the Gospel. Therefore if these things are no mentioned in a particular letter or sermon we can assume that is because they have already been taught as Jesus commanded, and thus make up the audiences previous knowledge base on which the writer or speaker is building. So, yes, I assume that James is assuming his audience has this basic understanding, as it would have been the first thing they were taught. There are other reasons why I make this assumption, but this will suffice for now. Why would you think this is hard to understand? I understand it perfect, and I agree with it to a certain extent. The existence of this Earth and all that live on it is centered on that one event, and nothing in LDS doctrine says otherwise. That is crowning moment of God’s glory and the point in History that all the faithful have looked too from the time of Adam to now, and will continue to look to until this Earth is brought to its end and is made glorious for the righteous to dwell on forever. But all of this misses my point. You cannot treat our doctrine in the same manner that you do yours. They are only different in what we believe, but in how it is set up. You have a very simple doctrine, and that is fine. 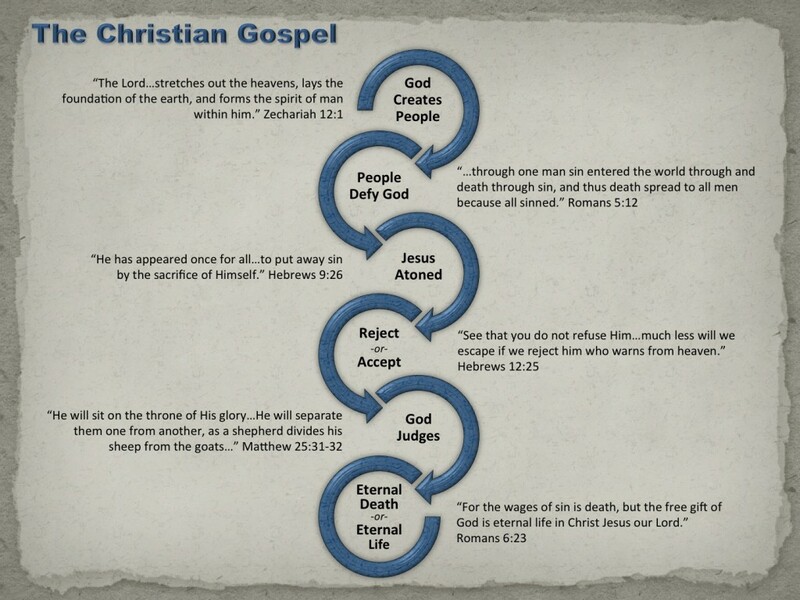 Our doctrine is not so simple. So do not complain when we teach our doctrine in a different style than you would teach yours. Yes, some assumption is needed, but then it is needed for you as well, as you are assuming that he didn’t intend this. I am assuming no such thing. I am only trying to let the author speak for himself. I do assume that James believed the same gospel that I do but I try and not read that assumption into what he wrote. Thankfully James never says that we are saved by what we do so I can just take what he said at face value. For whoever keeps the whole law but fails in one point has become accountable for all of it…………. So speak and so act as those who are to be judged under the law of liberty……………..Mercy triumphs over judgment. I assume his intentions based partly on the very fundamental teaching of Christ to preach repentence and baptism (luke 24: 47). Luke 24:47 does not say anything at all about baptism and it does not say that repentance is the “very fundamental teaching of Christ” and it does not say that repentance is necessary for each and every transgression of the law. You are assuming all of these things with out any warrant. You have a very simple doctrine, and that is fine. Our doctrine is not so simple. So do not complain when we teach our doctrine in a different style than you would teach yours. I’m not complaining at all I’m simply pointing out the difference between convoluted doctrine that requires all kinds of hidden assumptions and secret meanings and what the apostles taught, what the Bible says and what Christians have always believed ie (the simple Gospel) . That is the problem here. There is no hidden assumption or secret meaning. No more so than you would find a hidden assumption in a Calculus professor that is assuming his students know basic Algebra. That is my point, and one that you are failing to grasp. There is no hidden assumption or secret meaning because of who the intended audience is. You see hidden assumptions because of the way that you treat your doctrine, and thus you create a false comparison in your attempts. As to Luke 24: 47, I said this was the beginning and the most basic doctrine which Christ sent his disciples out to preach. I never expanded on its full implications, but left it at that. Now, forgiveness is the remission of Sins, which we are told three different times that such is through baptism. John the Baptist taught “baptism of repentance for the remission of sins” (Luke 3:3 and Mark 1: 4) and Peter declared to those in Jerusalem “be baptized every one of you in the name of Jesus Christ for the remission of sins” (Acts 2: 38). So when Luke 24: 47 mentions forgiveness I see the connection to baptism. As to Repentance, I make the assumption of fundamental teaching because it is the first thing that Christ tells his disciples to teach, as is shown in this verse. If it is the first thing taught than it is the very fundamental doctrine. This requires no great assumption that is not directly supported by the context of the reference. As to what repentance is and when it is required, that is found in other scriptures. My point was simply that repentance and forgiveness are the fundamentals that Christ sent his disciples to teach. What the specifics are I never made comment to. Thus you have already made an assumption. You example I find kind of funny, because when I read James that is exactly what I see him saying. Faith without works is dead, and thus Faith needs works to have any real effect in our lives. He never once says that these works are caused by the spirit, but makes very direct statements to our making conscious choices to perform those works. He uses Abraham and Rahab as examples of people who made choices, performed the work, and through doing so perfected their faith so that it was strong enough to save them. The best quote from James is “Yea, a man may say, Thou hast faith, and I have works: shew me thy faith without thy works, and I will shew thee my faith by my works.” Notice he does not say “And God will show you my faith by the works he does through me.” He says “I will show you my faith by my works.” He makes this very personal and very much in our control, and required of us. Faith without works is dead, and thus Faith needs works to have any real effect in our lives. 1) fire without heat is dead and thus fire needs heat to have any real effect in our lives. 2) A heart with out a heartbeat is dead and thus our heart needs a heart beat to have any real effect in our lives. Heat is the result of a “living” fire and a heart beat is the result of a “living” heart and laughter is the result of a “living” party. You don’t add heat or heartbeats of laughter or works to somehow make dead things come alive. What????? have you even read the book???? James 3: 17 speaks to the Wisdom of Heaven, not to the working of the Spirit in us. What he is saying here is not that the spirit causes us to work this way, but that it enlightens our minds and shows us what is good so that if we follow it we will do the good works that it inspires. Now I understand perfectly what you are saying, but I would disagree with your assessment. Your comparison to fire and all that is not accurate. It would be more accurate to say that the body without food is dead. Actually, this is what James uses as an example. Even as there is no profit to the body without food there is no profit in faith without works. Thus it is that Abraham’s faith was made perfect by works. Just as the body is made strong and healthy through proper diet, so too is faith made strong and enduring through proper works. This is so clearly the message of James. Just for the fun of it let us take your examples and see what it would really be. A fire is dead without fuel, but a living fire is one that spreads heats and warms the body. In the same way faith is dead without works, but a living faith is one that spreads good works and raises up every soul. A heart without nutrition is a dead heart, but a living heart pumps blood through the body bringing life and health to all. In the same way faith is dead without works, but a living faith spreads the power of God to all. A party is dead with entertainment, but a living party is filled with laughter and lifts the burdens of the weary. In the same way faith is dead without works, but a living faith is filled with joy and brings peace to soul in despair. What he is saying here is not that the spirit causes us to work this way, but that it enlightens our minds and shows us what is good so that if we follow it we will do the good works that it inspires. What??? There you go again, explaining how the text means is exactly the opposite of what it actually says. Just as the body is made strong and healthy through proper diet, so too is faith made strong and enduring through proper works.This is so clearly the message of James. Yet James clearly says just the opposite. James tells us that tested faith produces steadfastness which in turn makes us perfect and complete. Just exactly like fire produces heat. Just as I said. he says nothing about adding works to faith to somehow make it come alive. It would be more accurate to say that the body without food is dead. Actually, this is what James uses as an example. What??? James 2:15-16 is an admonition not an example. It is a parenthetical aside between verse 14 and verse 17. In these verses James does not say that giving food to a brother or sister is somehow a picture of adding works to faith. He is saying it is what saving faith looks like. This is all so patently obvious If it were a snake it would have bit you. When did I say the wisdom was not full of good fruits? I never said this. The wisdom is full of good fruits. But that does not mean that it causes us to be full of good fruits. That is where I think you are misunderstanding his intention. Notice also that before this he speaks of a different kind of wisdom that inspires envy and contention, and how that does not come from Heaven. “Wherefore, all things which are good cometh of God; and that which is evil cometh of the devil; for the devil is an enemy unto God, and fighteth against him continually, and inviteth and enticeth to sin, and to do that which is evil continually. In neither one are we told that the spirit of God causes action in us. Rather, all that enticeth us, or persuades us to do good is from God, and thus the wisdom of Heaven is that which inspires good works. Whether we follow that inspiration is our choice. James 1: 2-4 is not what you claim. This is made plain in the example of Abraham. In this introduction James tells us “that the trying of your faith worketh patience.” Later, in the example of Abraham he says “Was not Abraham our father justified by works, when he had offered Isaac his son upon the altar? Yes, it is through the trial of faith that our faith becomes perfect, but what is that trial except a test to see if our works will be right before God. Abraham’s was tried, and through his works he past the test and his faith was made perfect. James says to “count it all joy when ye fall into divers temptations” because only through such trials can our works strengthen our faith, as Abraham’s works made his faith perfect when he was sorely tried. Again, speaking of the body, does it gain any strength when we do not challenge it. If we can lift 100 lbs today but never try to lift more we never will. Faith operates on the same principle. We must work and we must pass the tests of faith through our actions, and then our faith is stronger and we have patience and can become perfect. Speaking of James 2: 15-16, I agree it is an admonition, but it is hardly an aside. James is making a clear comparison. What good does it do the body to not have the food needed to sustain life. In the same way, faith if it hath not works is dead being alone. Whether you put yourself as the one saying depart or the one starving, it doesn’t really matter. Neither one is profited by faith without works. It gives us nothing by itself. It must be tried and tempered through our works to be made perfect. I think I have demonstrated my point in this thread to the satisfaction of any reasonable person. I realize that you will never be persuaded by scripture or reason on this one so I think I’ll bow out. Thank you for the opportunity to defend my Lord and the sufficiency of his grace. I am always happy to discuss the gospel and I thank you for the time you have given here. I would also offer to anyone reading that if they are do not fully understand what I mean, or are not fully convinced that Monarchy is supported by the text to let me know. I will gladly try to explain things in further detail.